Tempis Fugit! Twenty-five years since Jane Bunnett captured the heart-stopping thrill of Afro-Cuban music on her extraordinary disc, Spirits of Havana. 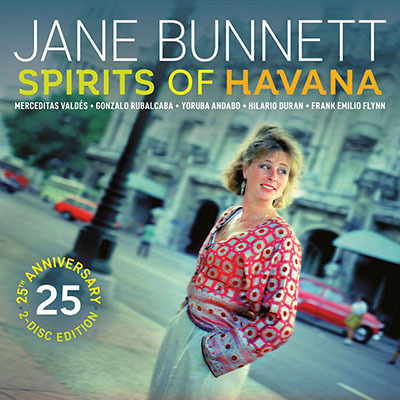 While there is not any real essential Jane Bunnett disc, because they all are, and it is almost time for a boxed set of Bunnett’s music, Spirits of Havana comes close to being an essential Bunnett album. It certainly marks a watershed in the career of Canada’s premier soprano saxophonist and flutist. The 1991 music relayed by a composing sage, with playing that burns the edges of the heart is compassionate, intensely lyrical music with meaningful sounds and silences and a rich, ripe tone, that deserves to be celebrated on its 25th anniversary. Banded together with her 1997 recording, Chamalongo, this double CD is a good deal to savour and confirms then as now that Jane Bunnett remains one of the greatest non-Cuban interpreters of Afro-Cuban music. Of course, being Canadian, she will always remain better-known in Canada than in the rest of the world. It’s just the way things are when you’re Canadian, but all that could change. I am listening to the original music as I await a copy of the commemorative release, with all the attendant flourishes photographs and notes in its booklet and no doubt a re-engineered recording. It’s been awhile since I spun these records. How fresh it still sounds today! Jane Bunnett’s playing is admirably forthright, the work of a musician with a magisterial control of both soprano saxophone and flute; playing that is tonally radiant and emotionally generous. Throughout, Bunnett plays with deep empathy for the music of Cuba and for the legendary musicians who have accompanied her on this journey. Just listen to the taut, swinging opening ‘Hymn’ a profoundly beautiful opening that prefaces the orchestral Spirits of Havana; real brawn before the saxophonist engages her heart with some deeply expressed playing. It’s possibly some of her finest work, not only of that period, but even thereafter. In many ways this was confirmed by Chamalongo, on which most of the same musicians played as on the celebrated Spirits of Havana. One of the classic tunes on Spirits of Havana will always be ‘G.M.S’ which was written by Frank Emilio Flynn, who also performed on it. Flynn is a master of an idiom he virtually pioneered, in which his Cuban soul was subsumed by the swing of Jazz. But it is Bunnett who captures your attention with a bewitching array of saxophone and flute summersaults; audacious, mischievous and unapologetically heart-on-sleeve. Her later forays both on this disc and on Flynn’s ‘Descarga a la Hindemith’ from Chamalongo are equally impressive. It feels almost nice to think of these two CDs as a move from the excited childhood of In Dew Time to the sudden, expressive and unselfconscious leap into adolescence. The performance on these two discs captures the ‘singing from the heart’ by a musician who was to become one of the most important champions of Afro-Cuban music after Dizzy Gillespie. This double disc set is interesting on a number of counts. One of the chief of these is the vocals by Merceditas Valdés. The chanteuse was one of Cuba’s greatest interpreters of song. Her poignant reportage of music is incomparable even today. What you hear in her vocals as she accompanies Bunnett (and vice versa) is total immersion in the music’s spiritual aspect. It’s fascinating to hear saxophonist/flutist and vocalist trade phrases and lines as each provides an impressive showing of the virtuosity that made their reputations what they are. Also, ever the animated charmer is the presence of Valdés’ husband, the master percussionist Guillermo Barreto, who passed away just before the release of Spirits of Havana. Barreto was ever the great percussion colourist and this is evident all over the recordings, and as much of the video footage of the recordings will attest, even when he was not playing. Always engagingly rumbustious Guillermo Barreto is nevertheless also the steadying hand that guided the rhythm of this music, ensuring that songs always made it to their intended destinations. The Jane Bunnett experience might never have unfolded the way it has done since the release of In Dew Time – already legendary for the inclusion of Canada’ own legendary musician, Claude Ranger – were it not for the indomitable energy and spirit of adventure of Bunnett’s husband Larry Cramer. Throughout Bunnett’s career it is as if all she has to do is dream of something and Cramer has magically made it happen. Cramer has never been given a fair shake for his abilities as a trumpeter and flugelhorn player, especially by American critics, but on both these albums his playing is wonderfully sympathetic and virtuosic. Whenever he appears on each of the discs, his reading of the music combines a sense of intimacy with flexibility and a deeply musical turn of phrase. And like Jane Bunnett, every performance by Cramer features some or other moment of magic. There is evidence of this throughout both discs but his most deeply memorable turn comes on ‘Spirits of Havana’, a chart that Cramer composed for the album of the same name together with the ineffable Guillermo Barreto. This two-disc presentation looks and feels like a million dollars. Memories are awoken by Rick McGinnis’ photography and his notes that accompany the booklet. The printed essays are informed, informing and often eloquent biographical commentaries with a plethora of photographs mostly by McGinnis. What I did miss is video documentary of the recordings – although a short (10 minute-or-so) clip has been posted on YouTube. As you’ll no doubt have guessed, I’ve only scraped the surface of this memorable package, but one thing’s for sure, the music is so beckoning that you will surely want all of it to listen to and hold as you would the commemorative edition of something special. It will prompt repeated listening, and, by absorbing the work of this most profoundly human and idealistic of musicians, we will likely become more human ourselves, something that in these troubled times we need to do more than ever before. “Spirits of Havana will always set the bar for any other recording endeavor of ours and will always be our firstborn in Cuba, a recording that we hold dear to our hearts. Set for release June 24, 2016 via Linus Entertainment, the deluxe re-issue includes a 2CD package with 3 unreleased tracks, 36 page book that includes historical photos and extensive notes by the late Robert Palmer and writer Ned Sublette. Bunnett will commemorate the release with a performance at the Toronto Jazz Festival on June 30.